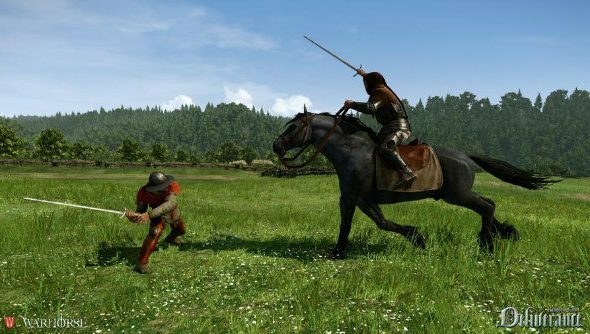 It feels like it’s been in development forever, but Kingdom Come: Deliverance, a medieval non-fantasy RPG by Warhorse Studios, is finally closing in on the finish line, following an internal alpha. Now it’s time for bug squashing, optimisation and QA, among other last minute tweaks. Keep an eye on our upcoming PC games list for its release date. There are around 80 quests, and they’re are all currently in the game. Though that’s a bit more than Warhorse originally planned, there were some quests cut to make sure the game could be delivered. One series of quests that got sliced out was a stretch goal that starred a woman hero, though this will be released as DLC, and it’ll be free if you’re a backer. So far, 10,000 bugs have been fixed, and there are just under 4,000 left to squash, though more are likely to pop up during QA. In a game that has a script that’s bigger than the Old Testament and with 3.5 hours of cutscenes, it’s no wonder. It’s gonna be huge. Console ports are also being worked on, but Vavra insists this isn’t negatively impacting the PC version. In fact, it’s helping. Because this is a game built for PC first, porting it to console means they’re discovering new optimisation tricks to make it run better on the lesser hardware, which is good news for people with mid-tier machines. Watch the development diary embedded above to see more about this exciting development, with full performance capture, music, weapons and more shown off.